Weather forecasts for the rest of the day and overnight have changed to milder predictions and Environment Canada’s Marine Forecast for western Lake Erie has been downgraded to a Strong Wind Warning. Winds are expected to remain around 35 km/hr from the southwest for the rest of the day before switching to a northerly direction overnight. Wind gusts aren’t expected to exceed 55 km/hr. The Marine Forecast is predicting wave heights to build to 2 m this morning then subside to 1 m overnight. The predicted wind speeds and wave heights are not typically associated with damage along the Lake Erie shoreline. 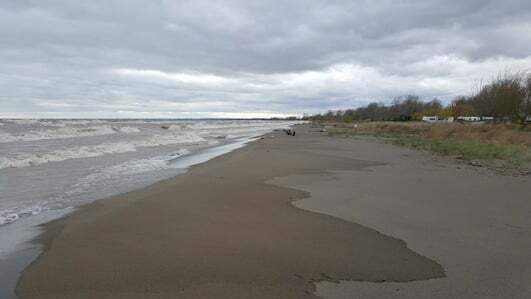 However, we have seen instances of flooding along Erie Shore Drive in Chatham-Kent earlier this year with winds and waves around these levels. Residents along the Lake Erie shoreline should be aware and pay attention to local conditions. People should take extra caution and avoid the shoreline should conditions get rough. The waves can be strong and the shoreline slippery. There could also be hazardous debris within the waves and water. Standing water can also present its own unseen hazards. Children, pets and livestock should be kept away from the water. Officials will continue to monitor the situation and update this advisory if necessary. This message will be in effect until November 3rd, 2017. Contact: Jason Wintermute (519-354-7310 x 227, jason.wintermute@ltvca.ca) regarding this message.